The most powerful mental tool at your disposal – a tool that always works no matter what the circumstances. The one, single capability you can develop that will transform your attitude from negative to positive. How to adopt a state of mind that makes stress and anxiety impossible. The most significant determinant of your stress level, plus much, much more! When you’re in the zone, energy, confidence, focus and fun combine to help you live a fulfilling and vital life. With the tools you’ll discover in Unlimited Energy, you’ll feel refreshed and relaxed after a long day’s work. For the past twelve years, Peter McLaughlin has been one of America’s foremost researchers and experts on the subject of enhanced health and peak performance. He has conducted his own research, studied other scientific research and has formulated all this information into a new, practical, step-by-step program designed to maximize your energy, reduce your stress, and improve your productivity. Have stress, frustration, and fatigue been affecting not only your work, but your day-to-day life? Now, Peter McLaughlin has put together a groundbreaking way to help you break away from this malaise, re-energize yourself, and acquire a powerful calmness and creativity! By implementing this practical, step-by-step plan, you’ll change yourself almost overnight and be able to work a top levels of energy, productivity, and fun – a critical capacity in today’s work environment of increasing pressure and constant change. Unlimited Energy is designed to power-boost your performance at work by showing you how to adopt positive changes to your mindset, attitude, work patterns, diet, exercise, relaxation habits, even your sense of humor. As you may already know, the business world today is one of constant change, chronic upheaval, and total instability. It’s a fact of medical science and biochemistry that change and life’s uncontrollable factors create stress. It’s also a medical fact that stress compounds itself. It’s natural for humans to worry and become anxious about the very stress they’re already experiencing. Rather than improving the situation, this creates an even greater problem. By fighting change and the stress caused by change (which is the natural human response), people become fatigued and de-energized. In his program, McLaughlin actually trains you not only to accept your high-pressure world, but to adapt and thrive in it. It’s definitely possible, but you must learn specific principles and follow some step-by-step techniques. If you have the lifestyle of an average American today, you’re probably eating the wrong foods and too much of them, exercising too little, and not taking enough time to relax your body and mind. Also, you’re probably spending much of your workday feeling tense and stressed out, which means you’re also not having enough fun. Like an overloaded computer, people with these kinds of attitudes and lifestyle habits work slowly, break down frequently, and constantly operate on the verge of crashing. Now in the same way you’d upgrade your computer, Peter McLaughlin shows how you can upgrade your work habits and lifestyle to achieve optimal levels of energy and productivity. An amazing 10-step program that shows you not how to change the world, but how to change and upgrade yourself. How to accept the fact we don’t know about the future and how to shift your focus so you can grow and prosper now, rather that become agitated and stressed-out about what might be. How the resources you have now – health, energy, productivity, awareness – can expand and be upgraded so you can quickly adapt to any situation! How the mind/body connection works … and practical methods of using this knowledge to maintain your Unlimited Energy. Prove it to yourself! 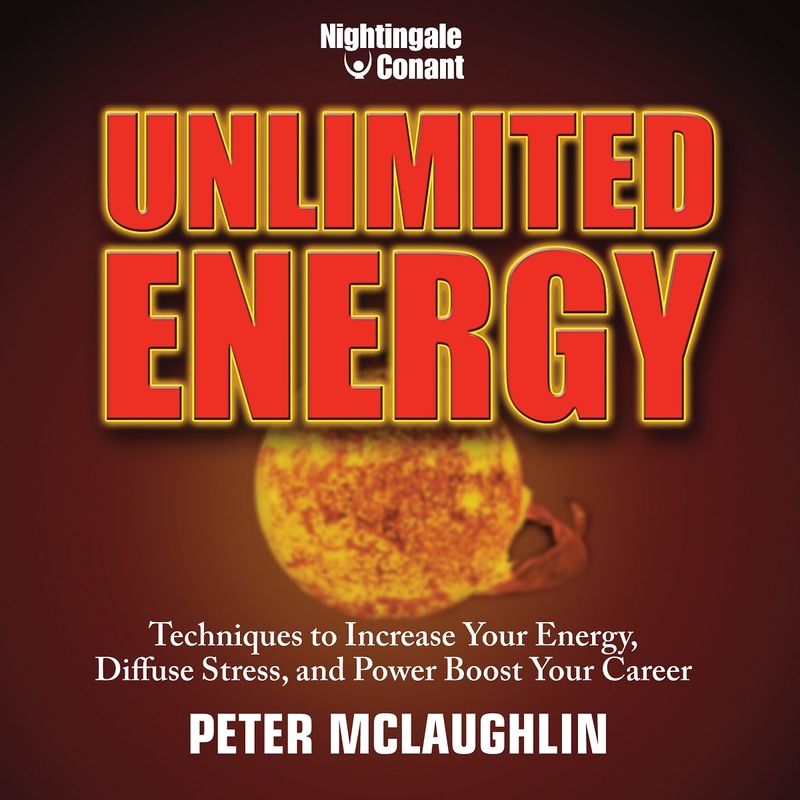 See how Unlimited Energy and Peter McLaughlin’s systematic plan can make a difference in your energy... your work... your career... your life. Session 1 – Discover an amazing new way to view the world and change, as well as the pace of change, so you can adapt rather than fight, either consciously or subconsciously. Session 2 – Discover one of the most powerful mental tools at your disposal – a mental tool that works for you no matter what the circumstances. Session 3 – Discover how to develop your self-awareness and control your attitudes and how to work and live with absolutely no stress or anxiety. Session 4 – Discover how to exercise control in the midst of chaos, retaining your cool when the pressure is on. Session 5 – Discover secrets of controlling your thoughts, rather than allowing negative mindsets to control them. Session 6 – Discover the way humor affects your emotional state, your thinking, and your relationships-at work and at home. Session 7 – Discover dietary misconceptions and what science has recently discovered about the connection between diet, the mind, moods, the body, energy, and peak performance. Session 8 – Discover how physical activity changes your entire biochemical makeup and how this makeup shapes not only mental performance, but emotional responses as well. Session 9 – Discover the facts about sleep; how much you need; quality and quantity. Session 10 – Discover how to tell if you’re a prime prospect for burnout and how to be an energized, hard worker and still have a happy balanced life. Session 11 – Discover how to change your environment to improve diet and physical activity, as well as encourage a more relaxed state of mind. Session 12 – Discover how to break down the barriers between work and home; encourage positive changes in your family; create a true support structure. Make the animal inside you stand up and ROAR! Without any pills, supplements, or horrible-tasting liquids! Unlimited Energy will unlock it and give you a life that's more passionate, more inspired, and more satisfying than you ever dreamed possible! I want to learn how to power up my mind and body so I can make more money, and always perform in your maximum energy zone! Unlimited Energy for the special price below.